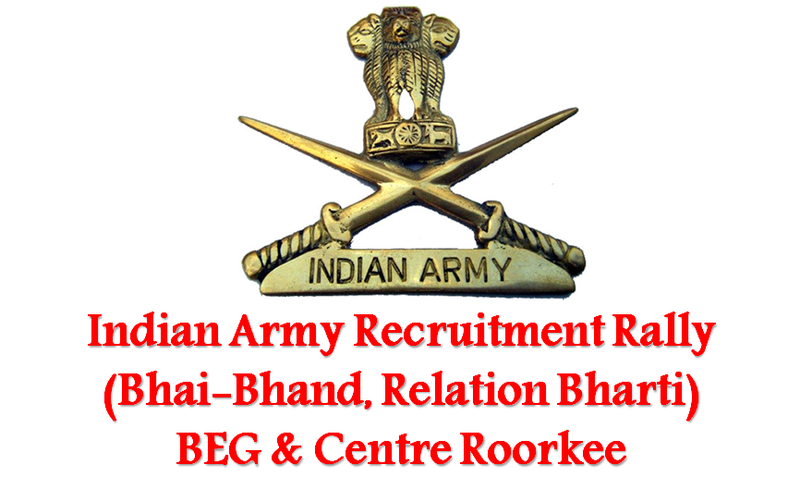 Indian Army will conduct recruitment rally at BEG and Centre Roorkee from 15 November. The five day long recruitment drive will be held for recruitment into Bengal Engineer Group, Corps of Engineers. The army recruitment rally will be held under Unit Headquarter Quota for son of Servicemen/Ex-Servicemen/ War widows and real brothers of servicemen/ Ex-servicemen & sportsmen of International/ National/ State/ District/ University level. Min 10th class or equivalent pass with 45% marks in aggregate & min 33% in each subject OR simple 10+2 pass. Important Note: Candidates are required to come for the rally with full preparation. Candidates are suggested to bring all relevant documents to the rally ground: 15 passport sized latest colour photographs, Original relationship cert, Discharge Book & PPO, Original Education Certificate, NCC/Sports Certificate if any, Nativity/Domicile Certificate, Caste Certificate for SC/ST caste, Character Certificate, Police clearance certificate and affidavit as per format. It is for the information of candidates that only Relatives son of Servicemen/Ex-Servicemen/War widows and real brothers of servicemen/Ex-servicemen & sportsmen of International/ National/ State/ District/ University level are eligible to appear for the rally. Wards & brothers of Navy, Air Force, Para Military forces are not eligible.